After filming wrapped on Venom earlier this year, Tom Hardy jumped right into Josh Trank's Fonzo, taking on the role of notorious gangster Al Capone. 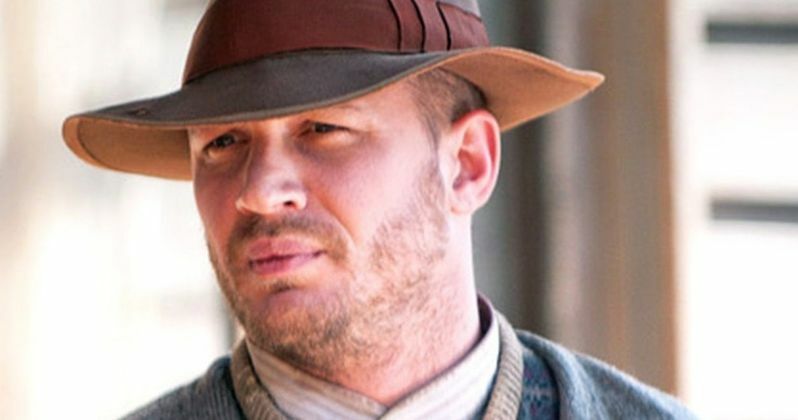 Some images were posted on social media back in April that showcased the transformation that Hardy underwent to get into character, but today, we have our first official look and it's astounding. Hardy looks completely unrecognizable as Capone under layers of makeup and looks pretty much just like the gangster in the later stages of his life, right before his death. Al Capone has been the subject of Hollywood movies before, most notably in Brian De Palma's The Untouchables, but Fonzo is going to be a much different spin on the story. Tom Hardy will depict Capone at the age of 47, which is really close to when he died at the age of 48. Following nearly a decade of imprisonment, syphilitic dementia rotted Capone's mind, which Fonzo will use to show his past becoming his present, as terrible memories of his violent and brutal past come screaming into his waking life. We've yet to see any footage of Fonzo, but now that this first-look image has been released, the trailer is more than likely right around the corner. The film is directed by Josh Trank, who is best known for making the found-footage superhero film Chronicle and the Fantastic Four reboot, which was not very well-received at all. Trank has become more notable for his behavior on sets than his directing work, with many saying that he has been hostile and inappropriate in the past. Fonzo could potentially mark a comeback for the director. It was announced back at the end of April that Run the Jewels rapper/producer El-P will be composing the score for Fonzo. The musician is very excited about his work on the film and fans are clamoring to hear what kind of style that El-P brought to the project. To announce the news, he shared a picture of himself with Tom Hardy in full Al Capone makeup and said that it was the only time in his life that he was better looking than an actor, which technically was right on the money. Fonzo is currently in the post-production phase, but there has yet to be a release date announced as of this writing. It's possible that a release date and trailer will be revealed in the next few weeks. For now, we just have some pretty interesting images of Tom Hardy as an aged Al Capone, with many wondering how the project will be approached. There's really not a whole lot of information about the film, which gives it a mysterious quality that will undoubtedly add to the hype once some footage is released. You can check out the first official image of Tom Hardy as Al Capone in Fonzo below, thanks to the Discussing Film Twitter account.